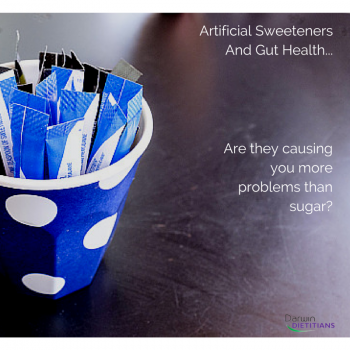 Darwin Dietitians | Artificial Sweeteners And Gut Health: Are They Causing You More Problems Than Sugar? The popularity and availability of artificial sweeteners continues to rise worldwide. Despite eliminating so much added sugar and calories from our diets, rates of obesity and type 2 diabetes continue to worsen. Are we missing a piece of the puzzle? New research published in the highly-respected journal, Nature, suggests that may very well be the case. It turns out artificial sweeteners may be seriously damaging the 100 trillion microorganisms that reside in your intestines. More commonly referred to as your gut microbiome or probiotics, it was only recently discovered that a healthy gut bacteria notably influences a huge variety of health aspects, from inflammation to blood sugar. 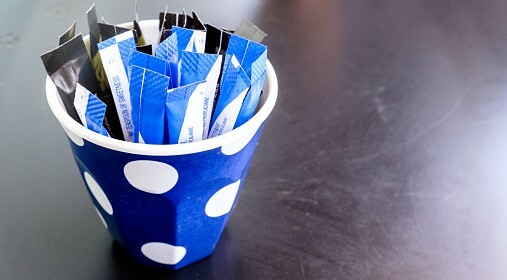 In this latest study, researchers ran a series of both rodent and human experiments investigating the effects of three different artificial sweeteners: saccharin, sucralose and aspartame. They found mice fed any of the sweeteners had significantly higher blood-glucose levels than mice whose diet included sugar, or just water. Mice with neutral digestive tracts were then given bacterial transplants from artificial-sweetener-fed mice, and displayed higher blood glucose levels than those receiving bacterial transplants from sugar-fed mice. The human trials found that those who typically use artificial sweeteners have different kinds of bacteria in their intestines than those who do not. They are also more glucose intolerant. Additionally, 7 participants fed artificial sweeteners for four days displayed higher blood-sugar levels as well as altered populations of bacteria in their gut. This research is still in its infancy, and additional follow-on studies are required before any dramatic conclusions can be made. But considering previous research has also found sweeteners can raise blood sugar levels, increase appetite, and do not actually promote weight loss, it would be naïve to ignore this new evidence. The reality is we are the trial generation for artificial sweeteners. It’s only a matter of time before we get our results back.